As Research Director, I’m a day-to-day contact for our clients, managing their projects from start to finish. I work closely with the project director, our field force, data processing and our stats teams to ensure the whole operation runs smoothly and that all involved are committed to getting the best result possible. The polite term might be ‘curiosity’, but in truth I’ve always been intrinsically nosey – perhaps even a closet geek! 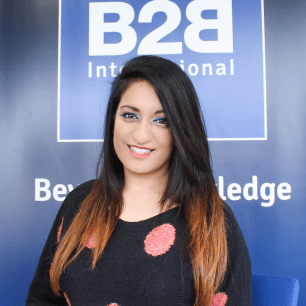 Therefore the best thing about B2B International is the variety of work we undertake and the fact that you are continually learning new things. I suppose, because we are not just focused on one specific market or geography, then you get to enjoy the challenge of boundless business knowledge. Good question! With zero hesitation, it was advice shared by my mother (mothers are so wise) when she said ‘Simi, always be nice to everyone on your way up, because you might see them on your way down’. I think it’s extremely important in all facets of life to stay grounded and to treat everyone with respect, no matter who they are, regardless of age, gender, background and so on. I think B2B International lives and breathes this culture as it’s very non-hierarchical and everyone’s views get taken on board. For example, all employees are encouraged to submit their ideas on an on-going basis via an “ideas@” email address. Even better than this, quite a lot of suggestions get implemented, which is refreshing! There are lots to choose from but the one that stands out is visiting the pyramids of Giza in Egypt alongside the Egyptian Museum of Cairo. It was simply jaw-dropping to visit a place I’d only ever seen in films or documentaries and to bathe in the mysteries that surround their construction. I visited in the peak of summer and so if you plan on visiting, I’d make sure you’ve plenty of ice-cold bottles of water at the ready! I’m a bit of a book-hopper these days and tend to make a decision on if it’s worth my time after the first two chapters, meaning I’ve only an exiguous few to choose from. I’d say for sentimental reasons, it would have to be “Pollyanna”. Given as a birthday gift, this was the first book that I owned and one that I will always treasure. I’ve kept it safe so I can pass it down the generations (as a meagre accompaniment to e-book-displaying tablets I’m sure!). Will I discredit myself by saying drinking red wine? No, on a serious note I think I’m definitely a culture vulture which probably stems from my intrinsic nosiness! I do love the theatre or any live performance as well as travelling or experiencing anything new. Being based in our London office is therefore the perfect spot as there are always new things to visit and explore – a bit of an adult’s playground really!